While it was rather surprising given the stance that evangelical Christians take on divorce, 81 percent of white, born-again, evangelical Americans supported the twice-divorced Donald Trump. The big question is, will this support continue in the 2018 midterm elections? President Trump pushed Congress to enact the largest tax cuts for the American people since President Regan. He cut the top tax rate on business from 35 % to 21 % – to make America an attractive place to build a business again. President Trump has signed more laws to slash unnecessary federal regulations and bureaucratic red tape than any President in American history. This slashing of regulations is saving American businesses more than $18 billion a year in costs. President Trump has saved the American people $3 TRILLION over the next 10 years by withdrawing from the so-called Paris climate accord. The economy under President Trump is growing twice as fast under President Trump as it was under Barack Obama. The U.S. economy has created more than 3,700,000 new jobs under President Trump. And the unemployment rate in the manufacturing sector has dropped to a record low of just 2.6%. More than $9 TRILLION in new wealth created under Trump. Average hourly wages up. As a result, welfare rolls are decreasing as more Americans are getting off the sofa and going to work. Food stamp use has plunged to an 8-year low under President Trump. Simple. Unlike Barack Obama, President Trump is not waking up every morning thinking up new ways to attack American businesses. Unlike the socialistic anti-capitalist Obama, President Trump is pro-business and pro-capitalism. As a result, we have returned to Reagan-levels of economic growth. When Congress was unable to get the votes to completely END ObamaCare, President Trump cancelled much of ObamaCare on his own. Specifically, President Trump. Ended the billions of dollars in illegal taxpayer subsidies for insurance companies. Made it easier for lower and middle income folks to buy health insurance by allowing people to buy plans off the exchanges that are half the cost of the ObamaCare Bronze plans. Announced the IRS will no longer fine people who don’t have health insurance because, if they can’t afford the health insurance, they probably can’t afford the fines either. Ended the outrageous Obama requirement that you must purchase health insurance that includes coverage for abortions. Illegal border crossings have dropped 35 % under President Trump. In fact, illegal aliens are now leaving America on their own. President Trump is doubling the number of border patrol officers. President Trump’s issued an Executive Order prohibiting the U.S. government from discriminating against Christians or punishing expressions of faith, affirming First Amendment protections for religious freedom. This Executive Order also requires the U.S. government to vigorously protect and defend religious freedom and public expressions of religious faith. This Executive Order ends the Obama Administration’s illegal misuse of the Justice Department and other federal agencies to prosecute and persecute Christians who express their faith." FFC also claims that Donald Trump has destroyed ISIS and made America's military strong again, transformed America's courts by appointing solid, conservative Constitutionalists to the judiciary and protected the right to life by denying funding to international organizations that fund or perform abortions. According to FFC, on October 12th, its volunteers had reached 1,716,840 voters of faith by visiting over one million homes of voters that have been identified as either evangelicals or Roman Catholics or have self-identified as pro-life, pro-marriage and pro-family. FFC has also reached 13. 4 million voters with voter education mail, placed 22 million digital ads on social media platforms and distributed 30 million voter guides in 117,000 American churches. Their goal is to achieve the largest turnout of evangelical and pro-life Catholic voters in a mid-term election in the modern era. 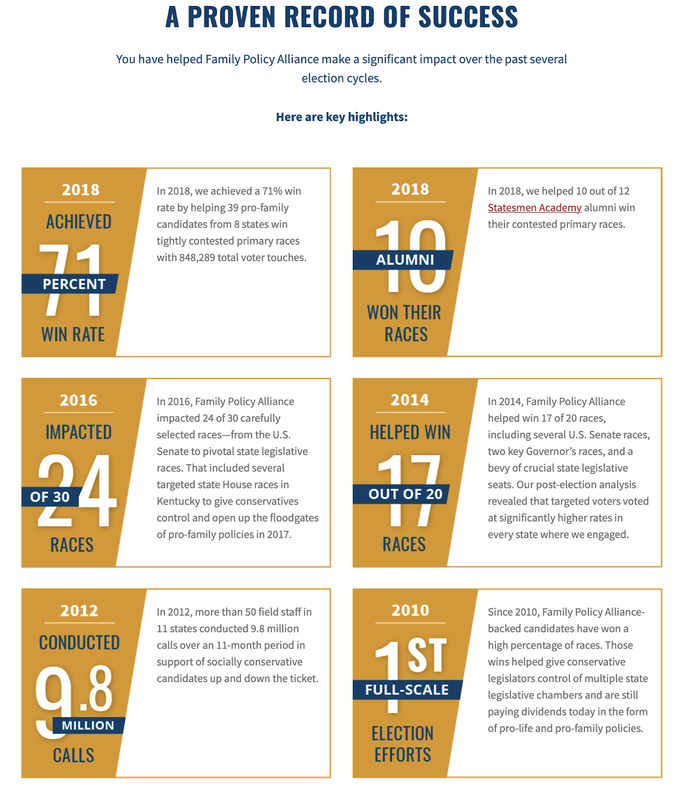 Not only does Family Policy Alliance want Americans to vote for its approved candidates, through its Statesman Academy, it actually trains future potential politicians who will be equipped to fight for family values from within government. "Family Research Council's vision is a culture in which all human life is valued, families flourish and religious liberty thrives." "...to advance faith, family and freedom in public policy and the culture from a Christian worldview." This event is being held to bring Christians together "for the sake of America" and to ask God to keep America moving in the right direction and, by right, I assume that they mean conservative. "Andrew Brunson is not hesitating to fulfill his pastoral duties, even after just returning home from Turkey after two years of imprisonment. 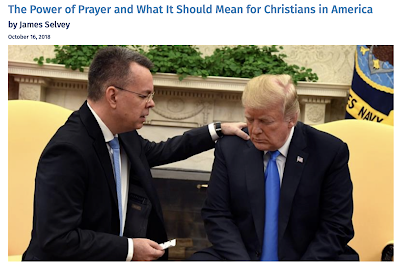 The pastor visited the Oval Office on October 13, asking the President if he could pray for him. “I need it probably more than anyone else in this room, so that would be very nice, thank you,” the President replied. "Though it is popular to conceive of the Republican party as “anti-poor” and opposed to minorities, these conceptions are not as neatly supported as many in the media would have us believe. Earlier this year Republican lawmakers voted almost unanimously to advance legislation designed to reduce recidivism through vocational training and education courses. House Republicans (262 of them) joined 134 Democrats in advancing this legislation. According to the NAACP, African-Americans and Hispanics make up 32 percent of the general population but 56 percent of those incarcerated. Thus, efforts to reform the criminal justice system represent positive steps forward in addressing problems that disproportionately affect minority communities. Further, not only is the current unemployment rate of 3.7 percent the lowest since 1969, the African American unemployment rate hit an all-time low of 5.9 percent in May 2018; in September, black teen unemployment fell to 19.3 percent, another all-time low. While the factors contributing to this picture are many, the fact remains that under Republican national leadership, more minorities are getting jobs. In short, if theologically conservative Christians appear aligned with the Republican Party, it is only because Democrats have forced them there by taking positions on moral issues that oppose the Bible’s explicit teaching." As you can see from this posting, evangelical Christians are taking an active role in this election, defending their political party of choice and backing the Trump presidency despite the best efforts of the "fake news" media and the hosts of late night television. It seems that even with the Stormy Daniels and Karen McDougal allegations/accusations, the Christian right is perfectly willing to vote for a candidate that their church leadership would normally regard as morally flawed.